A visitor to the African Savannah landscape cannot help but notice the giant trees that punctuate the plain or standout on the horizon. Baobabs (Andasonia) are truly giants of the tree world. Their great height is only match by their impressive girth; they are the largest and longest-living flowering tree (angiosperm) on Earth. US Person had the privilege of sitting and standing inside a Baobab trunk during one of his safaris. One Zimbabwean tree's circumference is so large that forty people can fit inside it. But scientists studying the giants have some sobering news: the oldest Baobabs are dying or are already dead. Their findings, published in Nature Plants, said that nine of the thirteen oldest and five of the six largest trees died during the research period, 2005-17. About sixty trees were examined in the study. 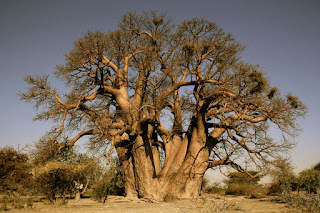 The oldest tree that died was 2,500 years old (the Panke tree in Zimbabwe). Baobabs can live up to 3,000 years according to Kruger Park in South Africa, and are very difficult to kill due to their multi-stem growth pattern. The researchers did not conclude that changing climate was to blame for the demise of so many old trees, but did "suspect that the demise of monumental baobabs may be associated at least in part with significant modifications of climate conditions that affect southern Africa in particular." There was no sign of disease in the dead trees. The authors called for more study of the shocking die-off. 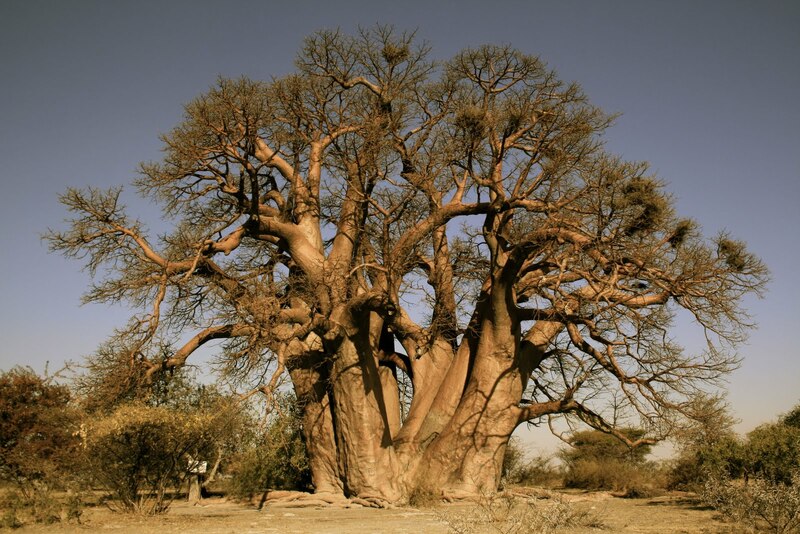 The most famous baobab is called Chapman, located in central Botswana. [photo] The initials of explorer David Livingston are carved in its trunk. Baobabs are important contributors to healthy ecosystems. They store massive amounts of water, and both animals and humans eat their fruit and leaves. The bark is used for weaving and rope making. Various baobabs have been used as a shop, a prison, a house, a storage barn, and a bus shelter. Truly a valuable member of the plant kingdom.